The latest Apple patent to surface from the U.S. Patent & Trademark Office details another of company’s ingenious little inventions, and suggests future devices could boast privacy screens that prevent curious eyes from gazing upon your tawdry activities while you ride the bus. The patent illustrates an LCD with adjustable levels of privacy defined by its user. Using a “scatter module” behind the screen, the light beams are steered in such a way that only the device’s user can view the content on its screen. Needless to say the feature would have other, more useful purposes, too – such as allowing users to view sensitive documents in public places – but I think my example best describes its advantages. 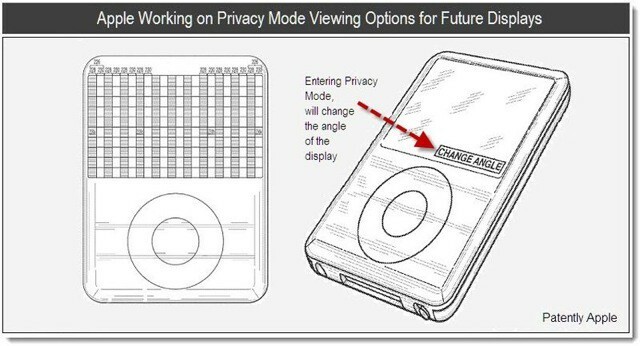 Entitled “Systems and Methods for Electronically Controlling the Viewing Angle of a Display” and originally filed in November 2009, the patent uses an iPod classic to demonstrate the technology. However, Apple specifies it could be used in a wide variety of devices, from cell phones to televisions. There’s no doubt, then, that if Apple developed its invention it would appear in the iPhone and the iPad, but patents don’t always indicate Apple’s future plans.